No matter its location -- whether it's the hip, stomach, chest, back, face or limbs -- the microdermal piercing's under-the-surface nature makes it significantly more difficult to remove than a traditional surface piercing. 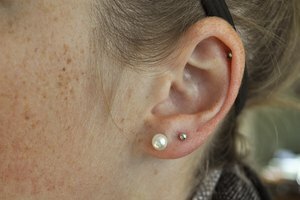 Whether the piercing is new or old, you may wish to remove the microdermal anchor -- the small, implanted plate that holds jewelry in place -- due to an allergic reaction or infection, for aesthetic reasons, or because the anchor may interfere with medical procedures such as X-rays, surgery, an MRI or a CAT scan. Don't try to remove one at home. When it's time for the microdermal to go, have a professional licensed piercer or physician remove the anchor. Before getting a microdermal piercing, check the piercer's credentials. Choose a body modification professional with plenty of microdermal experience to minimize your chance of infection or rejection, in turn reducing the potential need for removal. 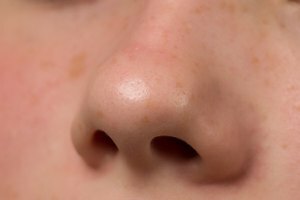 In some cases, your piercer may be able to remove the microdermal anchor with just a bit of hands-on tissue manipulation and the application of pressure, or by creating leverage with a piercing needle. If your body has rejected the anchor, it may have migrated toward the surface of the skin. In this case, the piercer may simply be able to twist the anchor so that it breaks the skin, allowing for its removal. For anchors that are still properly embedded, the body modifications expert may make a small incision with a scalpel, or work the anchor out with a pair of tweezers. In any case, the procedure begins with the professional sterilizing the area surrounding the anchor. To minimize pain, a physician may administer a local anesthetic, if you opt for removal at a clinic. Piercers may use a topical anesthetic. If no numbing agent is used, it's natural to expect a bit of pain. After removal, the wounds are sterilized and dressed with bandages or sterile strips. Once the anchor is removed and starts to heal, minimal scarring will likely occur, though the extent of the scarring varies by individual. After the procedure, follow the piercer's or physician's instructions for keeping the wound clean and dry to promote healthy healing and minimize scarring.